These little omelets are my new heartsong. They are low carb, protein rich, filling, and delicious. I’ve been making a pan a week for myself, one of the kids, and one for my husband. They cook up so quick and easy, completely hands off, and just pop right out of the muffin tin once cooled a bit. I then let them cool completely and place in a zipper seal bag in the fridge for quick and easy heat up breakfasts. Thirty to forty five seconds in the microwave and they taste like they were just made! I find that having things like this handy helps me stay on track because I have a “good” snack to grab rather than a bad one so I am far more likely to make that “good” choice. 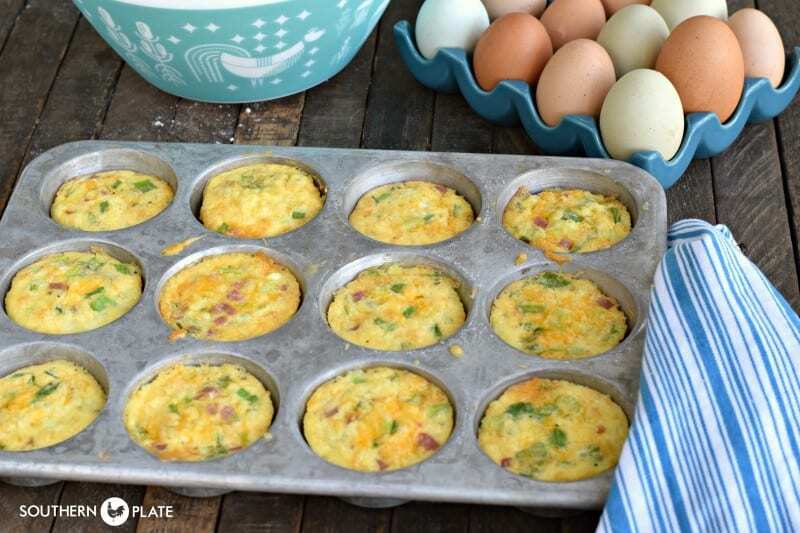 Some of my friends mix up just the egg mixture and put that in the muffin tins, then allow their family to add in their own toppings to each individual little omelet – an eggcellent idea! 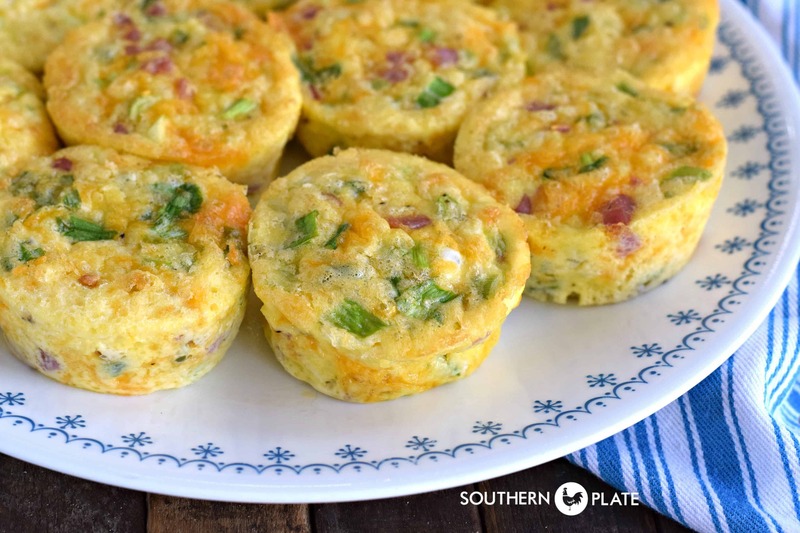 Sidenote: Dear people of the internets who are experiencing momentary outrage over me not calling these frittatas: move on to your next outrage. We’re good here. I actually had my Low Carb Cooking class vote on this last night and we overwhelmingly elected to choose “Muffin Tin Omelets” so thank you to all the folks in my class for lending your help in that! In large bowl, beat together eggs and cream until well blended. Stir in all other ingredients. Spoon into well greased muffin tin, dividing evenly among the cups. Bake at 350 for 20 minutes, or until set in the center. Allow to cool slightly before removing from muffin tin. Allow to cool fully before placing in zipper seal bag and storing in the fridge. Eat within 5 days. This is my favorite combination. Feel free to sub cooked crumbled sausage, bacon, or such for the ham. You may omit the onions entirely if you like, etc. Thanks, Christy, these look great and they’re so flexible! Have you tried freezing them and then reheating in the microwave? Thank you in advance! Sorry I don’t facebook either. I’m assuming based on the photograph, that this makes 12 muffin tins full, right? And how many servings do you think that would be? Looks easy to make. Would love to try it. These are really good and you can change from ham to bacon if you don’t have ham. These will help with my early morning meals, but I am also curious about the possibility of freezing them. Have you frozen any and how did change? I make these with different meats, veggies and even salsa, depending on what each family member likes. One wants spinach, chicken, salsa and cheese. Another wants mushroom, onion, peppers and ham. After cooling, I place in ziplock freezer bags and mark each family’s name, then pop in the freezer. They can pull out and microwave about 1 1/2 minutes. One or two of these with some fruit makes a healthy breakfast. Sometimes I will make them with tater tots or hash browns in the bottom. They don’t stay in my freezer for very long before eaten! As far as what kind of heavy whipping cream…..whatever is on sale. I have been low carb for a couple of years now, and I don’t even want to thing about how much HWC have used in that time. I get super excited when it’s on sale. To the person asking about what brand, be prepared for sticker shock!! If you have an Aldi’s they have a pint of heavy cream for $1.89 here in upstate NY. Sometimes they can be even less or a bit more in other areas. I seldom have cream on hand. I use evaporated milk a lot in place of cream. It has worked out so far. I haven’t used it to make whipped cream though my grandmother said it worked. Hey Jane! In this case the link was supposed to go to Facebook as it’s a Facebook giveaway so it’s all taking place there. I thought I had made that clear in the newsletter but now I see I didn’t. I apologize for that! Also on the pop ups, these happen when folks are on their phone. Usually if you will completely shut down your phone and start it again it clears your phone cache and helps tremendously. Thanks, Christy! These look easy, fast, and most of all- tasty. The low-carb part is just icing on the cake. (Except I guess sugar-free icing and cake.) And frittata, schmeemata: they look like muffin tin omelets to me 🙂 Will put them into rotation! Just made these little gems. SO good! I added 3 tsp. of salsa and some seasoned salt. Going to be perfect for my early a.m. breakfasts before work. Thanks for sharing! I just made these Gems. SO good! I added 3 tsps. of salsa and seasoned salt. These are perfect for my early a.m. breakfasts. Thanks for sharing! I made these earlier today and they are delicious! I did have trouble cleaning the egg out of my muffin tin, so when I make them again, I will line the individual cups with aluminum foil, butter the foil and continue as directed. Thanks for another delicious recipe! 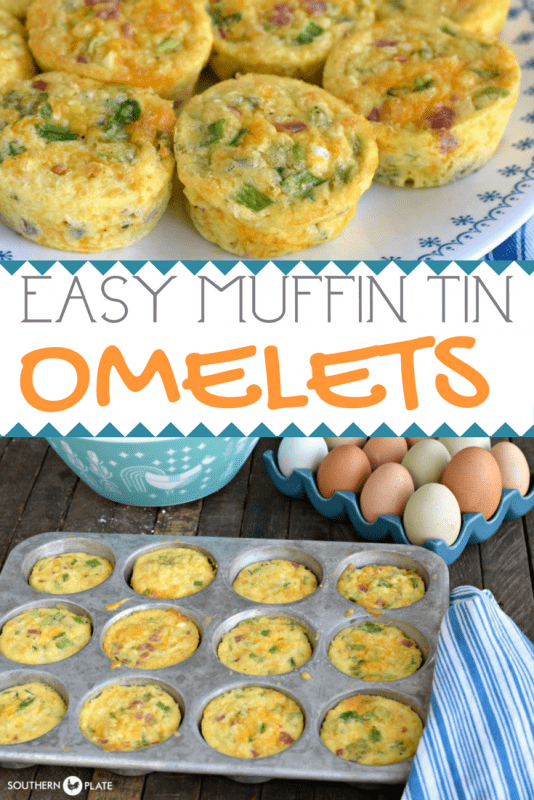 The muffin tin omelets look good will try them. I would love to put name in the White Lily Drawing that you have on your facebook page, I do not do facebook. I love your recipes and encouraging comments. I was just checking my emails this morning and came upon this post, so glad I opened it. I had some ham that I was wanting to use up today, and was considering making an omelet. Lo and behold Christy to the rescue! If your going to make an omelet, why not make enough for all week and stay on my low carb diet! They are in the oven now, can’t wait for breakfast! Wow, good timing, we got home late and these will make a great light supper, thanks. Great idea, hope you enjoy!! I just use Pam spray in mine. I did have sticking problems with my old muffin tins. Tried papers, but the egg stuck to them too much. Went out and bought a new muffin tin that has Teflon coating at Bed, Bath & Beyond. Made two dozen yesterday. Not one problem with sticking! Think I might go back to that, but,appreciate your reply. I used 10 eggs and got 18 muffins out of the recipe. I made 1/2 of them ham and the other 1/2 sausage. Sprayed the muffin tins with Pam and did not have a problem with sticking. Heats up very easy. I topped the muffins today with salsa. So good and easy. Thanks Christy. I am so glad to hear you liked them!! When does you new cookbook come out? And have you ever considered doing a gluten free/allergie friendly cookbook? I have made something very similar in my muffin tins and froze them in 2’s in freezer bags. They are great to grab, heat and go. This is such a good idea and I’m glad you said they taste like just-made when you reheat them in the microwave! When my hens are done moulting are start laying again, I’ll try making these and freezing them. Heck, maybe I’ll buy a dozen eggs and try them this week! Made these today with just cheese and tomato. My wife was sceptical about them till she tasted them. I used milk instead of cream, as fat percentage is important to me. Sounds wonderful! I will have to try them with tomatoes, oh my what a wonderful idea! We are eating low carb so heavy cream doesn’t have carbs whereas milk does – the way we eat the more fat the more weight you lose. Isn’t it crazy how there are so many ways to eat that are complete opposite but work for everyone in the end? Hope you have a great day and thanks so much for letting me know, I’m inspired! (Wish I had one of yours right now). I made these today and they are just great. I will try different fillings and hope they taste just as good. I am an elderly widow and it’s great to have something so tasty to take from the freezer and heat up. Bless you Christy. I am so glad to hear that you liked them Eileen!!! Blessings to you!! Can you use whole milk in place of heavy cream? A recipe makes a dozen but the serving size is going to depend on how many you want to eat in a sitting. 🙂 You can absolutely use milk in place of heavy cream. I use the cream to keep carbs down. Also would you consider making a section on your website for gluten free recipes? I’m afraid we don’t eat gluten free. While many of my recipes happen to be gluten free, I’m just not up to date enough on knowledge of that way of eating in order to section off a part of my site for it. There is lots here for ya, though! Since only 1% of our population has a gluten reaction, I can see why bloggers would find it difficult to devote space. On the other hand, folks with a gluten problem already know how to prepare their meals and remain comfortable with the results. To go on a gluten restricted diet without having a gluten problem is not wise as it robs you of important nutrients that are essential to a balanced diet. Don’t jump on this bandwagon unless your Dr tells you to do it. This fascination with non-gluten products is not a good fad for 99% of us. Just made your muffin tin omelets as trial run for Christmas morning brunch. They were great. Am sure will have to make more than one recipe. Love your new cook book “Sweetness”. Christy, even though we all know that real men don’t eat quiche, I do make these for my wife and I. It’s basically a crustless quiche. I have a number of variations like diced country ham, or bacon or spinach, or whatever. My one major improvement is that instead of using my old commercial muffin tins, I use large silicone muffin cups. It’s even cooking, much easier getting the muffins out and cleanup is a breeze. Just make sure to spray the inside of the cups with a nonstick spray or rub the insides with oil. Great idea, thanks for sharing Chris!!! Do you have the nutritional information ( fat g, carbs etc) on these? I don’t but there are several websites that can calculate it for you, just do a google search and it should lead you to one of them.